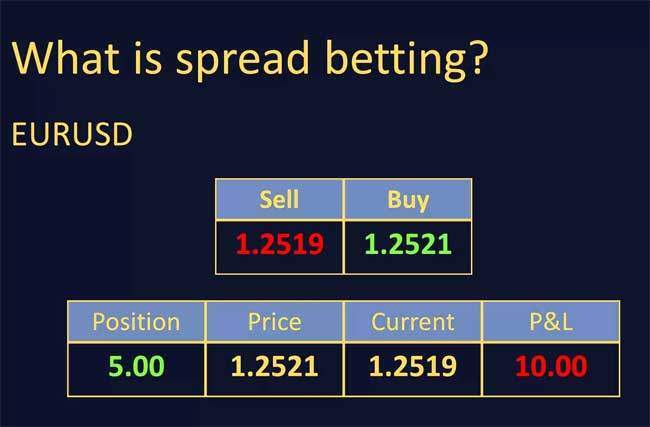 Spread betting involves placing a speculative bet on the price movement of a security based on the bid and offer prices (spread) offered by the spread betting broker–without taking any position in that security. According to a research by the Cass Business School in London, only 20% of spread betters make a profit. Spread betting simply allows you to speculate on whether the price of an asset will rise or fall. Compare financial spread betting companies and find the best spread betting brokers. Many people who are indulged in the financial market and industry must have been familiar with Foreign Exchange or Forex. This asset trading is an activity of buying or selling currencies from all over the world at their current price. However, there is another activity that happens inside Forex, which is the spread betting. Basically, people can bet on the price movements of foreign currencies and can win or lose more because of it. Even though it is too risky than a conventional Forex trading, the profit that they get is not taxable. For you who are interested in trying this method, here are some reputable Forex brokers that accept Spread Betting. This financial company is based in the United Kingdom and has been operating since 1965. Internationally, it also operates in Denmark, Spain, Hungary, Ireland, and the Czech Republic. Trading activities with U.S. Dollar, Euro, and GBP is accepted. You only need $100 to open an account in ETX Capital. Based in the United Kingdom, City Credit Capital has been operating since 2001. It also opened its offices in Brazil, Hong Kong, and Chile. It accepts trading activities with Euro, GBP, U.S. Dollar, and Japanese Yen. The normal account is at $5,000, but you can open a mini one at $500. Core Liquidity Markets was established in 2013 in Australia. Trading activities with U.S. Dollar, Euro, Pound Sterling, and Japanese Yen is accepted in this financial company. It is cheaper than the previous broker since you only need $250 to open an account. This U.K.-based company is still new to the industry since it was established in 2014. However, it already opened its branch in Singapore, Hong Kong, and UAE. It accepts U.S. Dollar, GBP, and Euro. The account starts at €200.